The average insurance prices for a Toyota RAV4 are $1,310 every 12 months with full coverage. Comprehensive costs an estimated $280 a year, collision costs $482, and liability coverage costs $390. 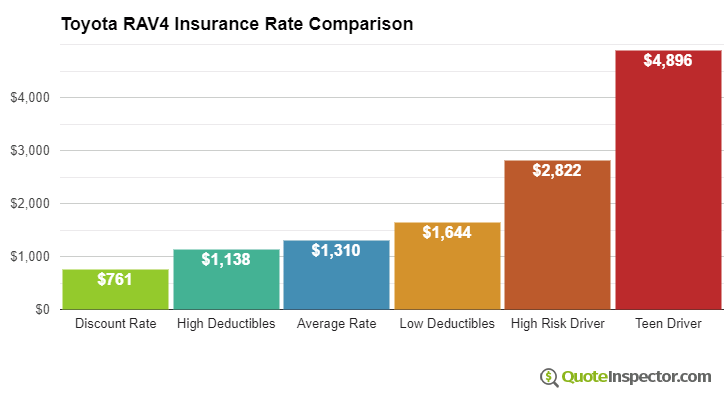 Liability-only coverage costs as little as $452 a year, with high-risk coverage costing around $2,822. Teen drivers cost the most to insure at $4,896 a year or more. Estimates include $500 deductibles, bodily injury liability limits of 30/60, and includes both medical and uninsured motorist insurance. Prices are averaged for all U.S. states and RAV4 trim levels. 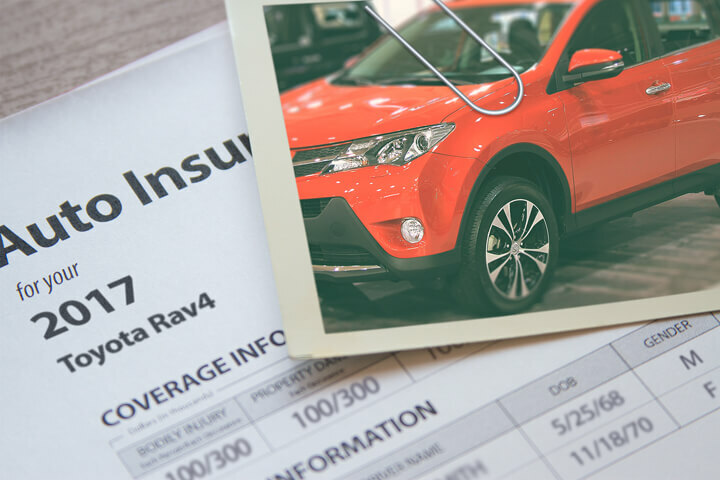 For a driver in their 40's, Toyota RAV4 insurance rates go from the cheapest price of $452 for minimum levels of liability insurance to a high of $2,822 for a driver who has had serious violations or accidents. Your location has a large influence on car insurance rates. More rural locations are shown to have more infrequent collision claims than larger metro areas. The diagram below illustrates how location helps determine insurance prices. The examples above demonstrate why it is important to compare rates for a targeted area and their own driving history, rather than using price averages. The chart below details estimated Toyota RAV4 insurance rates for other coverage scenarios. Insurance rates for a Toyota RAV4 also range considerably based on liability limits and deductibles, your driving record, and the model year and trim level. Your home state makes a big difference in Toyota RAV4 insurance rates. A 40-year-old driver could pay as low as $940 a year in states like Utah, Ohio, and New Hampshire, or as much as $1,770 on average in New York, Michigan, and Florida. Because rates have so much variability, the best way to find out which auto insurance is cheapest is to get quotes and see how they stack up. Every company uses a different rate calculation, and rates will be varied. Rates are averaged for all Toyota RAV4 models and trim levels. Rates assume a 40-year-old male driver, full coverage with $500 deductibles, and a clean driving record. Finding cheaper rates on auto insurance not only requires not taking risks behind the wheel, but also having above-average credit, not filing small claims, and maximizing policy discounts. Invest time comparing rates every other policy renewal by requesting rates from direct companies, and also from your local independent and exclusive agents.